Posted on February 1, 2018 at 9:00 am. Though Olivia, Kathy and Elise each wind up at the Summerhouse for separate reasons, it’s not long before they begin to open up about their regrets, their wishes and their dreams. And when they’re presented with the opportunity of a lifetime—a chance to right the wrongs of their past—all three discover what can happen when dreams really do come true. 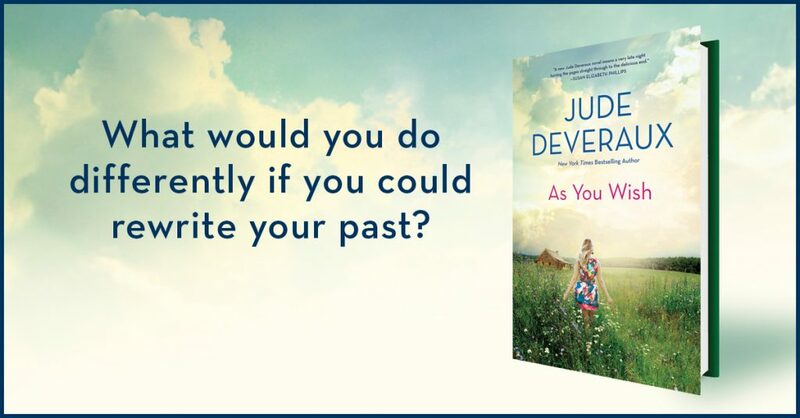 Celebrate friendship and second chances with the launch of Jude’s brand new Summerhouse novel, As You Wish! Enter the Sweepstakes below for a chance to win a $100 VISA Gift Card, tote bag and a custom mug, notebook and pen. NO PURCHASE NECESSARY TO ENTER. Purchase or acceptance of a product offer does not improve your chances of winning. Sweepstakes opens 02/01/2018 at 12:01 PM EST and close 02/28/2018 at 11:59 PM EST. Enter online at https://www.bookclubbish.com/?p=8624. Open to legal residents of the U.S. and Canada (excluding Quebec) who have reached the age of majority in their province/state/territory of residence or older. Void where prohibited by law. Void in Quebec. See Official Rules for prize details. Prize ARV: $225.00 CAD. Odds of winning depend on the number of eligible entries received. Official Rules available online at https://www.bookclubbish.com/as-you-wish-sweepstakes/. Sponsor: Harlequin Enterprises Limited. Sounds like a good read. I would love to win. I found Jude Deveraux books by mistake and it was the best mistake. I love her books. You pick up one of her books and you can’t put it down until your finished. Never heard of her,but I do like to read books as long as it’s large print seeing how my eyes are bad and I’d love to win,thank you. I’m quite intrigued with the story line. Would love to read and share with friends….perhaps, pick it for my book club. Would love to win this cool book! I have a bunch of Jude’s books in my bookcase. Love them. Ready for a New book especially by Jude. All her books are wonderful. Haven’t read you yet, but plan on the next visit to the bookstore! Thanks for the chance to enter your contest. Will put this on my list of books to read this spring. Sounds fascinating. Love to read. Sounds like a good book! I love her books! I would love to win one! Jude’s are always Awesome reads! love her books, I am reading one now. I have been reading Jude Devereaux novels for many, many years! There hasn’t been one I did not like! Thanks for the chance to win this book. It sounds like an awesome read and I hope I do win. Jude’s books are the gifts everyone gives me and then I pass them on! I would love to win!!!!! I absolutely LOVE these books I came across them one day and loved them so much! Looks like this will be an awesome read!!!!! I would spend more time learning about my family histories before my parents passed away. I spent a lot if time with them so there’s no regret there. I wish I would have asked more about their lives growing up, etc.